We define a service as a set of transactions, activities or information that share a user need and can take place online and offline. Most of the time, people don’t want to use our services. What they want to do is go on holiday, move country or get a new job. Our services are things they have to do to get what they want. The ideal service would be one where the user doesn’t have to do anything at all. An example might be where a user needs to provide proof of employment and salary to one department, when HMRC already has this information. For this to work teams and government departments need to take a step back and work together. Services should reflect what someone wants to do. Or, as Louise Downe, head of design for government puts it, good services are verbs, and bad services are nouns. We’re collecting examples of how to identify a good service. Common problems we tackle in service design include enabling people to prove their identity or eligibility for something, and helping people understand what they’re entitled to. We also design for behind-the-scenes activities: the services people need to do their jobs and keep the UK safe. The Home Office is involved at major stages in people’s lives: being born, moving country, getting a new job, moving home and getting married. Yet the services people need to use in many of these areas are split into fragments and spread across government departments. This makes it hard for someone to find out exactly what they need to do and when they need to do it. First, they either need to learn how government works, or they need to be able to afford to pay someone that does. As an example, a person coming to work in the UK has to spend time figuring out all the things they need to do. They then spend more time understanding which government department they need to speak to, and even more time completing the tasks. And remember English may not even be their first language. Staying in the UK, the full service mapped. Click on the image for full resolution. 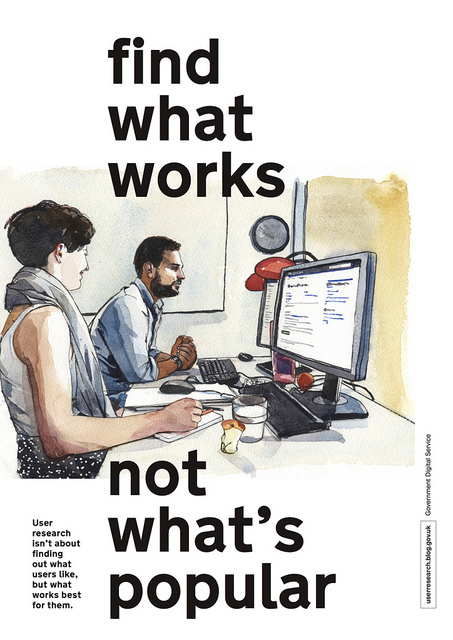 If we do user research or think about systems in only one part of a person’s actual journey, we miss the chance to design the end-to-end service in a way that works better for people. And by better, we mean what actually works best, not what’s popular. We’ve all heard the adage that ‘government makes the rules, you don’t have to like them, you just have to follow them.’ But when you count the real cost of supporting a system designed with this perspective, you see that better services are mostly more efficient services. We see the impact of this when we look at the time and money spent on or by people doing the wrong things. We see time and money wasted on manual processing, duplication and repetition. We notice how much it costs to help people who are confused or scared. We count up the time spent handling complaints. A well designed service makes it simpler and easier for users to comply with rules, and easier for government to enforce those rules when needed. 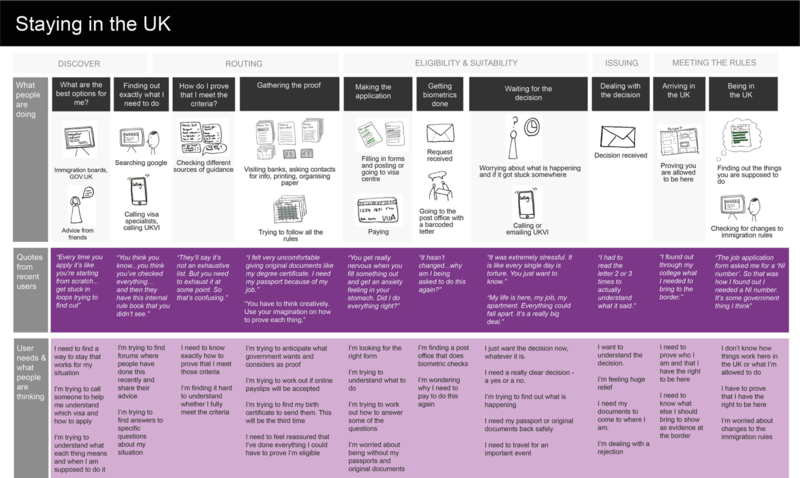 What does service design actually look like? The better we can understand what the user is trying to achieve - alongside the policy intent - then the easier it is to completely rethink how the service works and better meet the user’s need and desired policy outcomes. As service designers we sometimes build maps to help visualise how services work. These maps can help us spot similarities between services, how transactions can be reused across multiple services, and how a service can be provided by more than one part of government. Service maps enable us to identify opportunities to create patterns and standards. They help us see where the creation of registers, API’s, platforms and other building blocks could make designing services easier. We’re finding that there are common service failures across government, and we think there could be some common solutions. So we’re working on these new, broader service patterns as a way to scale service design. As service designers we work quickly, we build prototypes and we test which options work best with real users. We do this to understand how to make services that are better for people, are easier to build and are more efficient to run. We’ll share more on service patterns that we’re working on in the coming weeks. Part of a service designer’s role is to identify opportunities where we can have maximum impact. This might include looking at things like costs, transaction volumes or hours spent – both by users using the service and by government in delivering the service. Cost saving is not the only measure of success. Confidence is also very important. Government is complicated, and we need to give confidence to the user that they are using the right service, and that they know what the outcome will be. We also need to ensure the team processing the user’s data has confidence in the information provided. We can also measure a service by how well it achieves the policy objectives that underpin it. Transformation at an organisational level doesn’t come just from building more things differently. It starts with how decisions get made and how governance needs to work. It comes from the organisational and financial structures that underpin everything. For service designers, it means aligning what we do with what people need of government. It requires us to understand actual policy intent and identify areas of biggest opportunity - and then re-think how services work. We’ll be hiring new service designers in Home Office Digital soon - one of the most exciting places for a service designer to work right now. Keep an eye out for roles being advertised. We’d love you to join us. Interesting article. As a Service Design & Transition Manager I look at my role as an enabler for new IT services. A major challenge will always be ensuring the needs of the business are met and the mantra - "Find what works, not what's popular" is an accurate one. Service Design in respect of new or upgraded IT Services will always a balance between availability, security and performance, a sound technical solution and probably most important, what is pragmatic and affordable.